frankfurt’s summer vanished a couple of weeks ago but thankfully it seems to be back – sunshine and warm temperatures aplenty. having said that, this dish straddles the seasons nicely, being full of fresh summer flavours whilst also looking towards cooler weather when you know you want something warm and with a greater depth of flavour than the simplicity of a summer salad. the recipe is courtesy of bill granger and flavours balance beautifully – harissa, honey and lemon; a few warming spices and fresh parsley leaves. i also really liked the lightness of the gravy. needless to say, i made a few changes, adding lemon zest as well as juice; i only used half the quantity of chicken and next time i will add the fennel later on in the recipe. heat the oil in a wide, heavy-based pan over a medium heat. season the chicken with salt and freshly ground black pepper. cook, skin-side down, for 6 to 8 minutes until golden, then turn the chicken over. add the onions and fry for another 6 to 8 minutes, until the onions begin to soften. stir in the garlic, cumin, saffron, harissa and honey and cook, stirring, for 1 further minute. add the fennel to the pan (abby note: i would delay and add the fennel later, with the other vegetables), pour in the stock and bring to the boil. 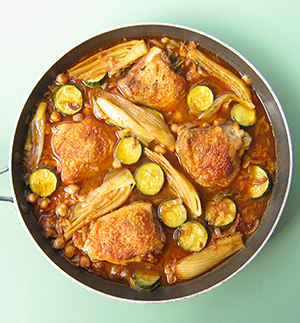 simmer, covered, for 20 minutes, add the chickpeas and courgettes, cook for a further 20 minutes, or till the chicken is cooked through. add the lemon juice (and zest) and more salt and harissa, to taste. stir in the parsley.